Nativa en Colombia; Alt. 500 - 2500 m.; Andes, Sierra Nevada de Santa Marta. Perennial with rambling culms 15–100 cm. long or more. 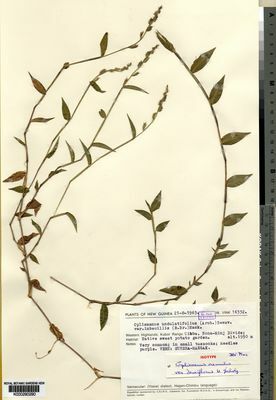 Leaf-blades narrowly lanceolate to narrowly ovate, 1–13 cm. long, 4–20 mm. wide. Inflorescence 3–15 cm. long, comprising 3–9 racemes each 0.5–3 cm. long with glabrous to sparsely pilose rhachis and ± contiguous spikelets, or the upper reduced to fascicles; sometimes all the racemes very short, but then the awns also short (less than 7 mm.). Spikelets lanceolate, 2–4 mm. long, glabrous to sparsely pubescent; glumes with smooth viscid awns, the longest in each pair of spikelets 3–14 mm. long. 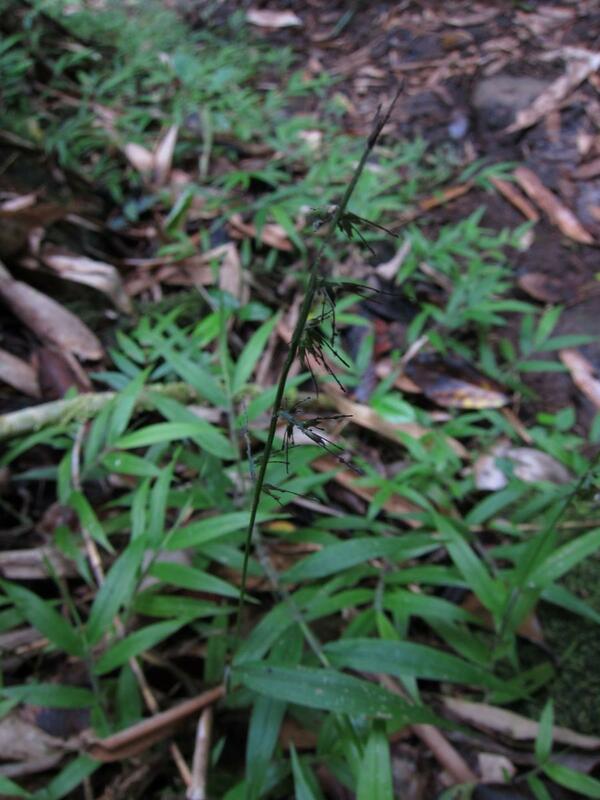 In forest shade; 0–2500 m.
Rambling perennial with lanceolate to narrowly ovate leaf laminae. Culms 15–100 cm. long or more. Racemes with a distinct rhachis up to 3 cm. long, the spikelet pairs contiguous; rarely the racemes all ± cuneate, but then awns also short. Spikelets 2–4 mm. long, glabrous to sparsely pubescent; awns smooth and sticky, the longest in each pair of spikelets 3–14 mm. 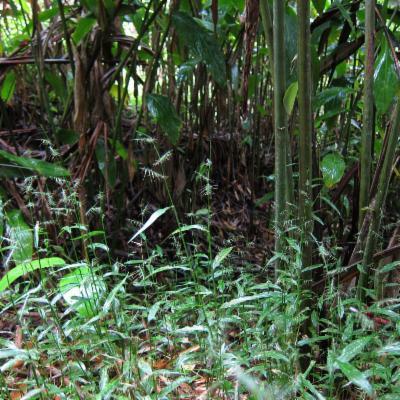 Straggling, often with long aerial roots from the nodes Forest shade. 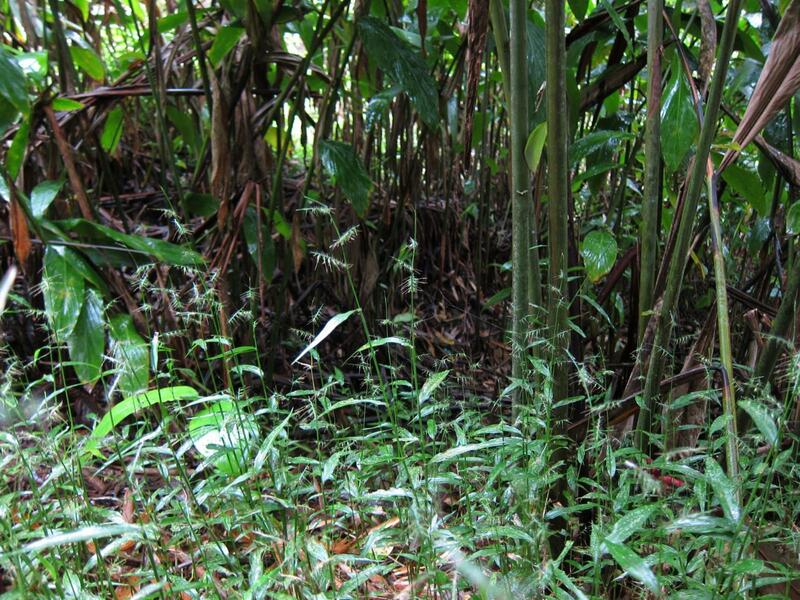 Rather variable, particularly in the size, shape and hairiness of its leaf-blades, and also in panicle characters. Perennial. Culms prostrate; 15-100 cm long; rooting from lower nodes. Ligule a ciliate membrane. Leaf-blades lanceolate to ovate; 1-13 cm long; 4-20 mm wide. Leaf-blade venation with obscure cross veins. Inflorescence composed of racemes. Racemes 3-9; borne along a central axis; unilateral; 0.5-3 cm long. Central inflorescence axis 3-15 cm long. Rhachis angular; glabrous on surface, or pilose on surface. Spikelet packing contiguous; regular; 2 -rowed. Spikelets in pairs. Fertile spikelets sessile and pedicelled; 2 in the cluster; subequal, or the lower smaller. Pedicels oblong. Spikelets comprising 1 basal sterile florets; 1 fertile florets; without rhachilla extension. Spikelets lanceolate; laterally compressed; 2-4 mm long; falling entire. Glumes similar, or dissimilar; shorter than spikelet; thinner than fertile lemma. Lower glume ovate; 1 length of upper glume; 0.5-0.7 length of spikelet; herbaceous; 1-keeled; 5 -veined. Lower glume surface glabrous, or pubescent. Lower glume apex acute; awned; 1 -awned. Lower glume awn 3-14 mm long; viscid. Upper glume ovate; herbaceous; 1-keeled; 5-7 -veined. Upper glume surface glabrous, or pubescent. Upper glume apex obtuse; muticous, or awned. Upper glume awn 2-4 mm long. Basal sterile florets barren; with palea, or without significant palea. Lemma of lower sterile floret ovate; 1 length of spikelet; membranous; 1-keeled; 7-11 -veined; glabrous, or pubescent; emarginate; mucronate. Fertile lemma oblong; dorsally compressed; 2-2.5 mm long; coriaceous; shiny; without keel; 7 -veined. Lemma margins involute. Lemma apex acute; laterally pinched. Palea involute; coriaceous; without keels. Africa: Macaronesia, west tropical, west-central tropical, northeast tropical, east tropical, southern tropical, south, and western Indian ocean. Asia-temperate: Arabia. Asia-tropical: India, Malesia, and Papuasia. Australasia: Australia and New Zealand. Pacific: southwestern, south-central, northwestern, and north-central. North America: north-central USA, south-central USA, southeast USA, and Mexico. 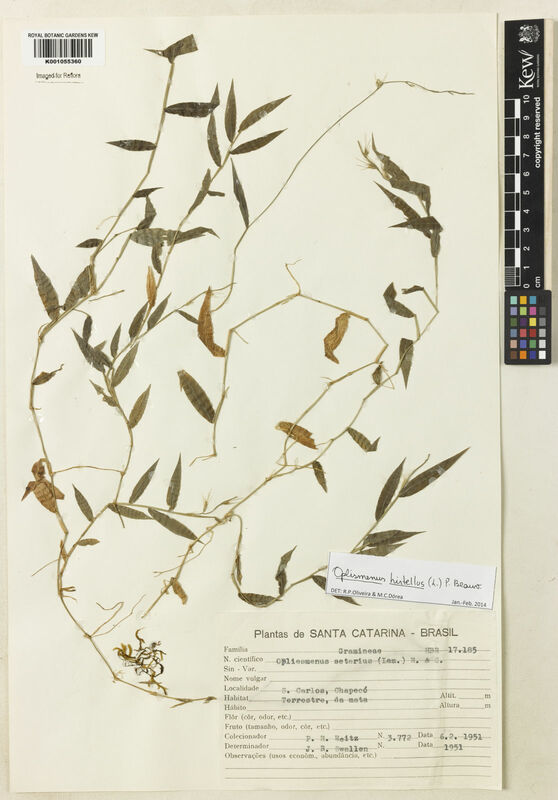 South America: Mesoamericana, Caribbean, northern South America, western South America, Brazil, and southern South America. 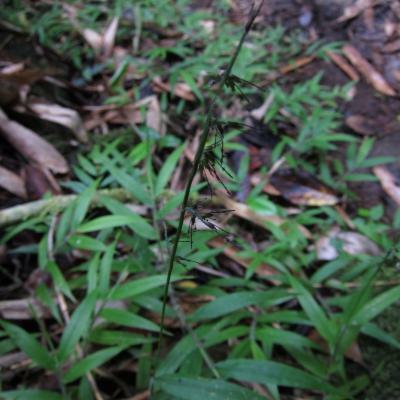 Echinochloa cubensis (Spreng.) Schult. & Schult.f. Oplismenus acuminatus Nees ex Steud. Oplismenus brevisetus (Steud.) Nees ex Steud. Oplismenus compositus var. loliaceus (Lam.) Hack. Oplismenus flaccidus (R.Br.) Roem. & Schult. 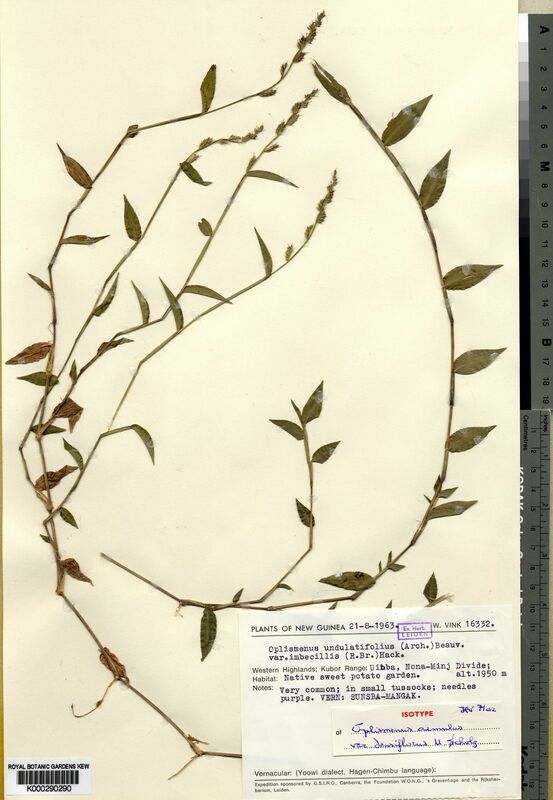 Oplismenus latifolius Haenke ex Steud. Oplismenus oahuaensis Nees & Meyen ex Steud. Oplismenus undulatifolius var. imbecillis (R.Br.) Hack. 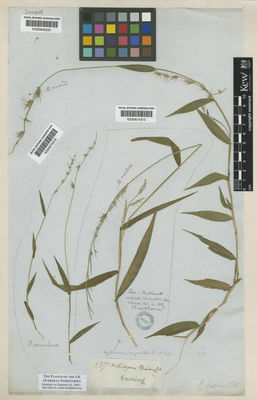 Panicum barbifultum Hochst. ex Schltdl. Berhaut, Fl. Sén. ed. 2, 401. Clayton in Flora of West Tropical Africa, ed. 2, 3: 437 (1972). D.M. Napper, Grasses of Tanganyika: 80 (1965). K.W. Harker & D.M. Napper, An Illustrated Guide to the Grasses of Uganda p. 43 (1960). A.V. Bogdan, A Revised List of Kenya Grasses p. 42 (1958). Jackson & Wiehe, Ann. 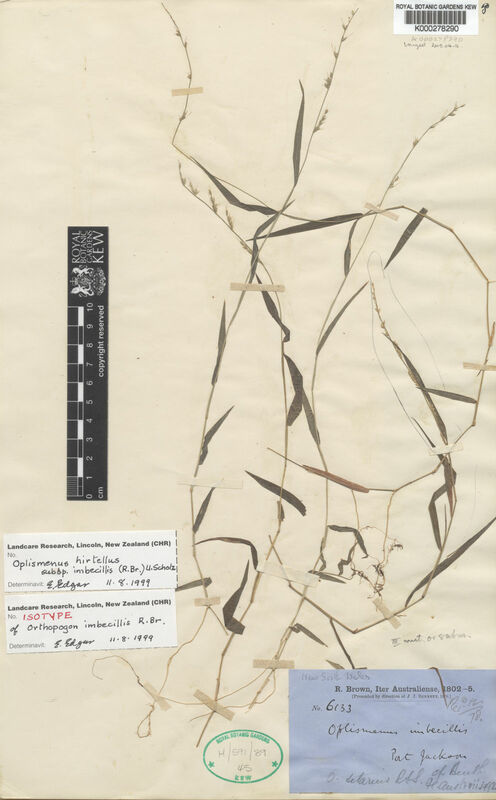 list Nyasaland grasses: 49 (1958). F. W. Andr., The Flowering Plants of the Sudan 3: 493 (1956). 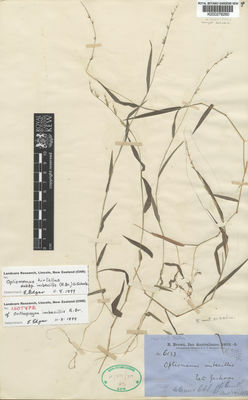 Robyns, Flore des Spermatophytes du Parc National Albert 3: 93 (1955). Eggeling, Ann. list grasses Ug. : 29 (1947). Robyns, Fl. Agrost. Congo Belge 2: 147 (1934). Stapf in Flora of Tropical Africa 9: 631 (1920). P. Beauv., Ess. Agrost. : 54, 170 (1812).